Very pretty TT, colours mingle beautifully! That's a perfect pink - I can smell it too! Hey, TT, wonderful combination! I've seen this colour of lilac in one of the village garden. Pale pink. Never seen it before. I think I will ask for some offshoots, as I intend edging the garden with lilac of all colours I could find. Do you know the name of the lilac in the picture? Lovely combo you have there. That's a lovely photo. 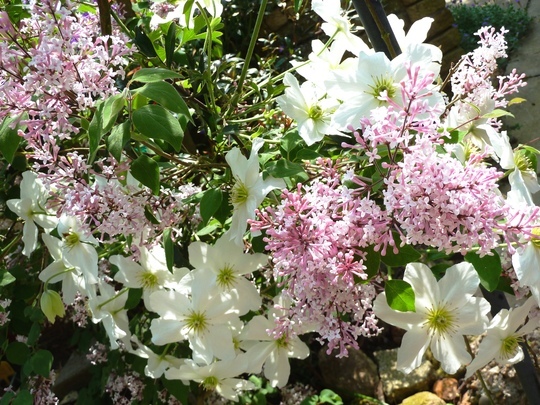 What is the clematis variety ? I'll check on the clematis label and let you know. Hi Convr ... Thanks ..
... the lilac aroma is wonderful .. I bet it is....I reckon the hardy shrubs and trees have loved the very cold winter, blossoms this year are extra lovely! Both seem to gently invite you to pull your garden chair a bit closer and to enjoy the beautiful scent along with the warm rays of spring sunshine. Hope you get to do that, but with such a lovely garden you likely haven't got much time to sit down. Love a lot of your other pictures as well! Thanks for sharing them and giving me ideas. This part of my garden gets a lot of sunshine, and the lilac scent is super ... there is a bench nearby ... but I don't really get much chance to sit there ! Did you ever get around to tracing this lilac Terratoonie ?and do you have a name for the clematis ?...stunning combination ! Syringa meyeri spontanea 'palibin' .. I'll put another comment here if I find it. 14 May 2012 ... LILAC TIME in my evening garden. Glad you found the lilac, Susie. Have just noticed this - your beautiful garden never ceases to amaze and dazzle me! Yes, it is a lovely scent - very special.